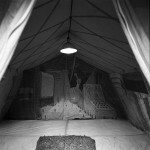 Toronto artist Brian Scott will erect a walk-in allegorical painting/relief within a tent. 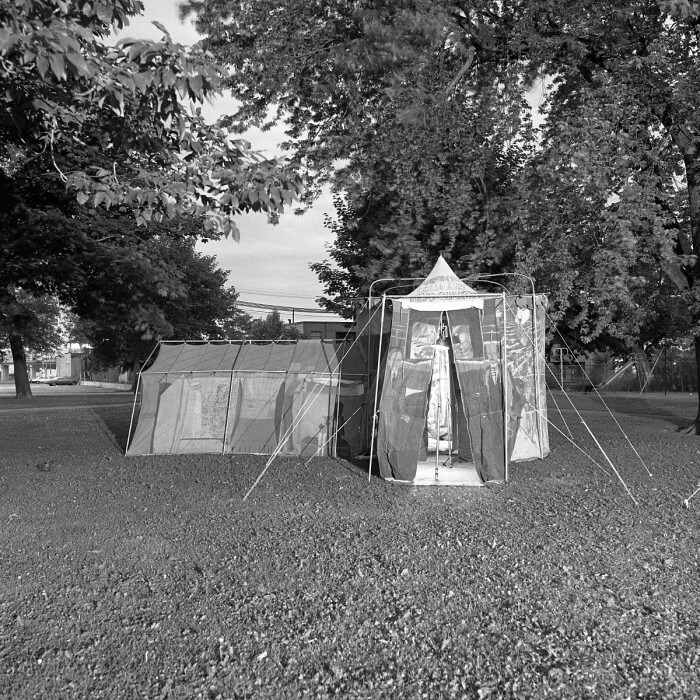 Entitled, “Christopher Columbus Headquarters”, this three part tent, approximately 24′ x 20′ x 10′, is made of canvas and entirely painted. The viewer walks in and is surrounded by ‘a depiction’ of Christopher Columbus and crew landing in the New World. Christopher Columbus is used as a main metaphor for human progress set within an evolutionary spectrum that reaches into the past and projects into the future. It marks the dawn of the 21st century. “Christopher Columbus Headquarters” is something of a time machine where sequential time is seized and examined. 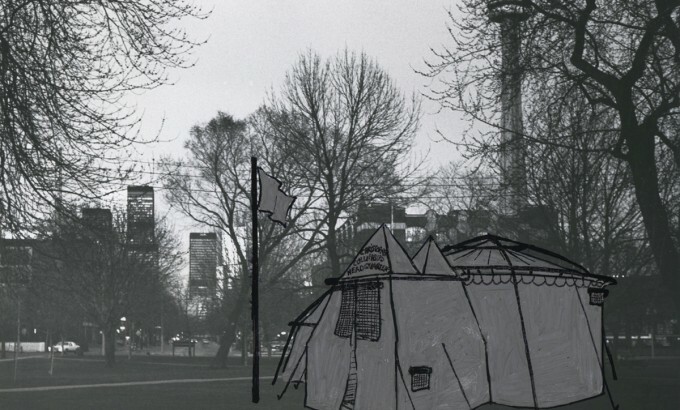 “Christopher Columbus Headquarters” will be shown on clear nights, Wednesday through Saturday from 8:45 pm to 11:00 pm, June 18 through July 13 at Victoria Memorial Park (the corner of Portland and Wellington). When the painting, stained onto the canvas, is shown at night and lit from the inside, a lantern effect is achieved. Affiliated drawings made prior to and during the execution of this piece will be on exhibit in Mercer Union’s West Gallery from June 18 to July 13. 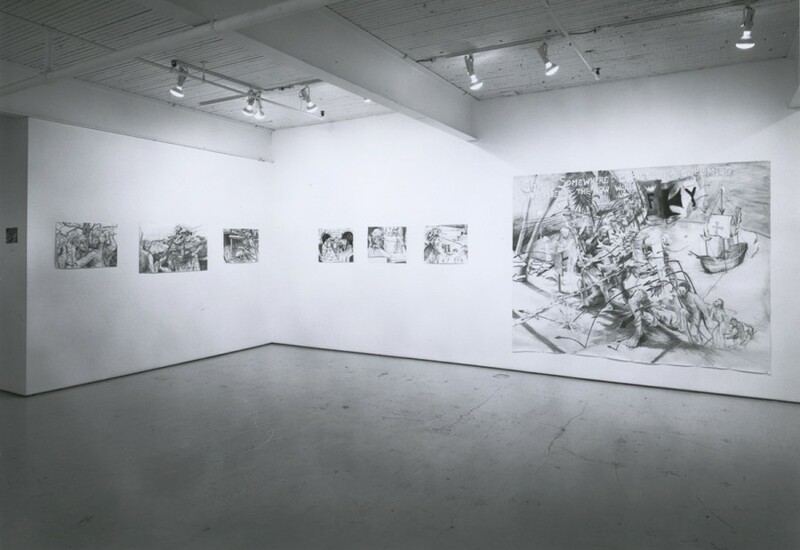 Brian Scott studied Fine Art at John Abbott College in Montreal from 1973 to 1975. From 1975 to 1978 he attended both St. Martin School of Art and Central School of Art in London, England. 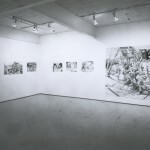 Since 1978, he has participated in solo and group exhibitions in Toronto, Montreal, and London, England. 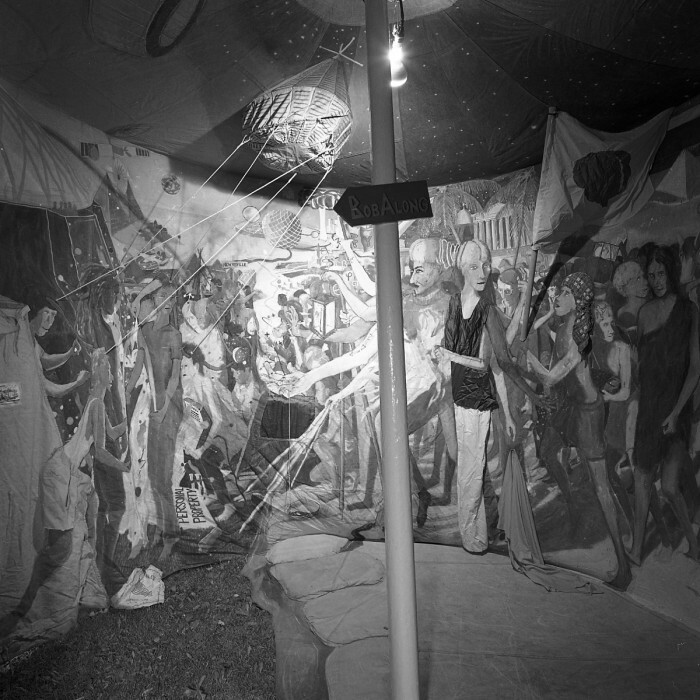 Brian Scott’s show had two parts: an outdoor installation, featuring ‘paintings on canvas tent’, the walls of which were pitched nightly in a public park at the corner of Portland and Wellington Streets; and 21 pen, ink and watercolour sketches on paper which hung in the East Gallery at Mercer Union. 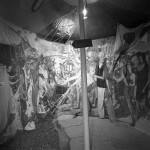 The outdoor installation was lit from the inside by a string of incandescent lights, creating a scrim of images that from a distance resembled the eerie luminescent hearthstone of some gruesome carnival sideshow. Not just another roadside attraction, this was The Christopher Columbus Headquarters, simultaneously a monument and a ‘portable museum’, filled with a hodgepodge of various ideologies and theoretical representations of such pioneering spirits’ as Einstein, Marx, Christopher Columbus and Martin Luther King, arranged in heroic, apocalyptic tableaux that could either adorn the walls of a temple or the pages of a colouring book. 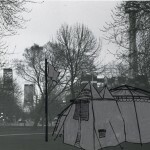 This is ‘history’; an artist roughing it in the bush with the pioneering spirit of that first Canadian Camper to document her experiences – Susannah Moodie Scott, however, has set up Camp in the universal Global Village; in the cold urban core of downtown where history is a matter of writing it. Scott’s concept of the tent has adapted itself to the obnoxious character of history, which is transitory and repetitive, and where the attempt to represent on a consummate level often manifests itself as ludicrous, or (as in the case of the famous complaint against the museum) the contents of a morgue. The most interesting thing about Scott’s tent is that it mimics the concept of the ‘Museum Without Walls’, the ideological basis for many artist run spaces. 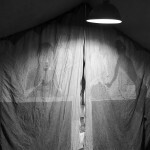 This truly portable museum, by the simple fact of shining light through some canvas, also functions as a giant window through which we can see the interior of the museum: windows not walls. However this device is not serviceable during daylight hours thereby limiting the installation to the idea that the pursuit of knowledge, and often art making, can be a subversive activity. 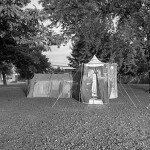 The tent itself consists of four chambers. The entrance is a corridor where we are saluted by a parade of historical luminaries. 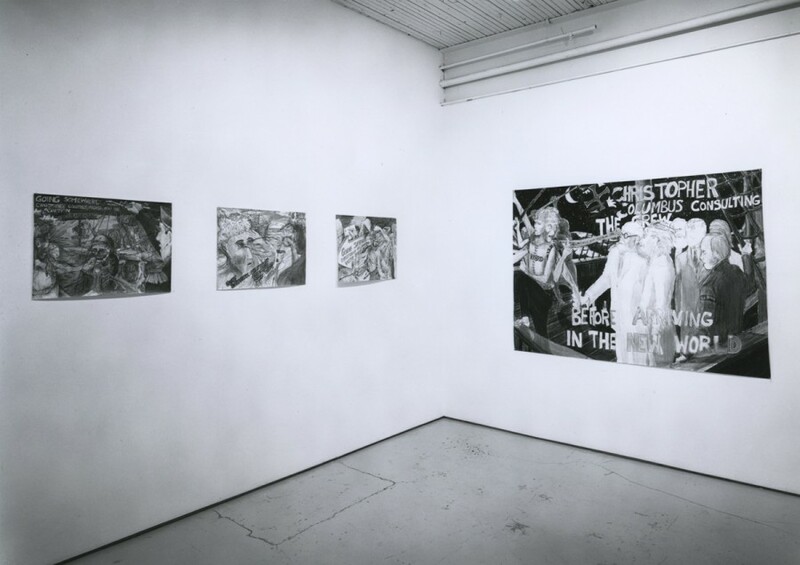 Banners and regalia are signature themes in Scott’s work, and here the regalia is clothing, the shabby pants and shirts of Einstein and Marx, emptied of form and affixed to the two dimensional representation of their personage. This dark canal of philanthropists, explorers and scientists leads into a large, brightly painted ’round room’. On a post in the middle hangs a sign “BOBALONG”, a not so light-hearted distortion of the word Babylon with all its distressing connotations of ruin and decay. Surrounding it is a representational narrative which exemplifies the weird pulp sensibility of Scott’s figurative style – part Gauguin, structurally schematical most cartoon-like in its illustration, demonstrative of a cryptic almost macabre flare for parody. The arrival of Christopher Columbus in the New World is depicted in a simultaneous evolution and de-evolution of images that circle the room in a revolution that is literally painted under a ‘canopy of stars and planets’. Scott is fond of painting this kind of dramatic moment, with an obsessive attention to the representation of character and situation in the context of a great myth. A small atrium decorated with ghostly figures joins this room to an Epcot Centre-like chamber. 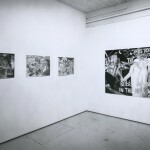 On the canvas walls is a ‘FutureWorld’, a kind of Orwellian scenario of buildings and computers engulfing ‘people like ants’, an environment paralleling the representation of Columbus’s ‘New World’ in the ’round room’. The work at Mercer Union also depicts ‘other worlds’, both old and new, of mythic proportion and in humorous juxtaposition. 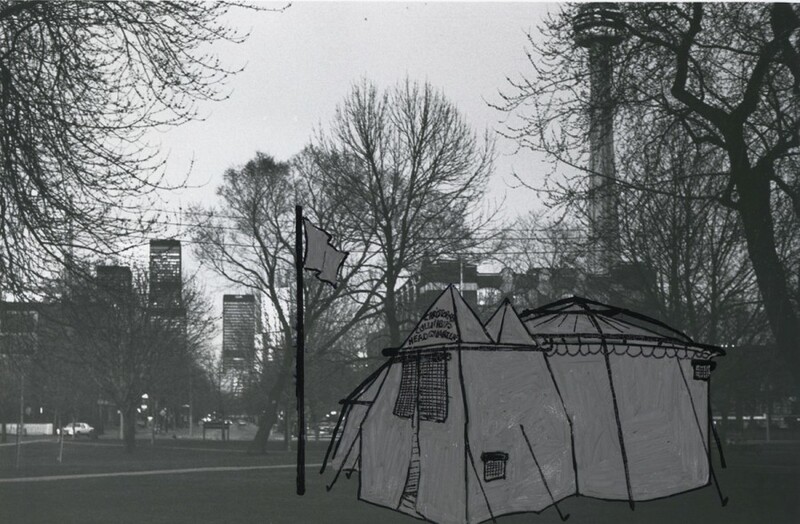 The ‘Christopher Columbus/Going Some where’ series consists of studies for the outdoor installation linked as an ongoing narrative predicated by the phrase “Going Somewhere?” The remaining eight sketches are of a more profound, fantastical and personal nature: D.J. Showdown at White Desert, Cop vs. Con, Popathon in Bobalong, D.J. 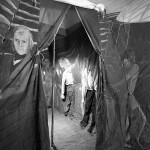 Showdown: The Information Eater vs The Potato Eater at the Local Village and the portraits Under The Plastic Bohodi Tree Sat Saint James and A Historical Portrait of Sarah, Going Somewhere Youth Movement are almost McLuhanesque in conception with a brutal honesty that stands on its own.